Hey guys, my name is Stephanie. 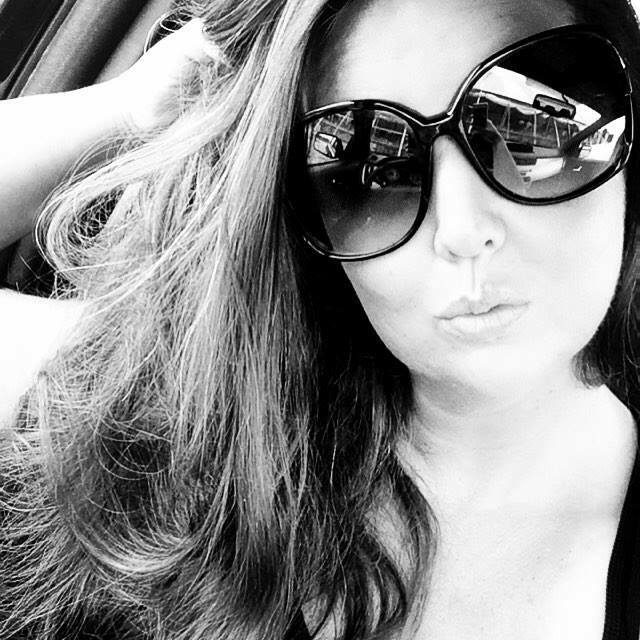 I'm a professional wedding planner from upstate New York. Given that its currently subzero temps here, I figured I’d show you a peek into the frigid life of New York weddings (what better way than by sharing my story?). 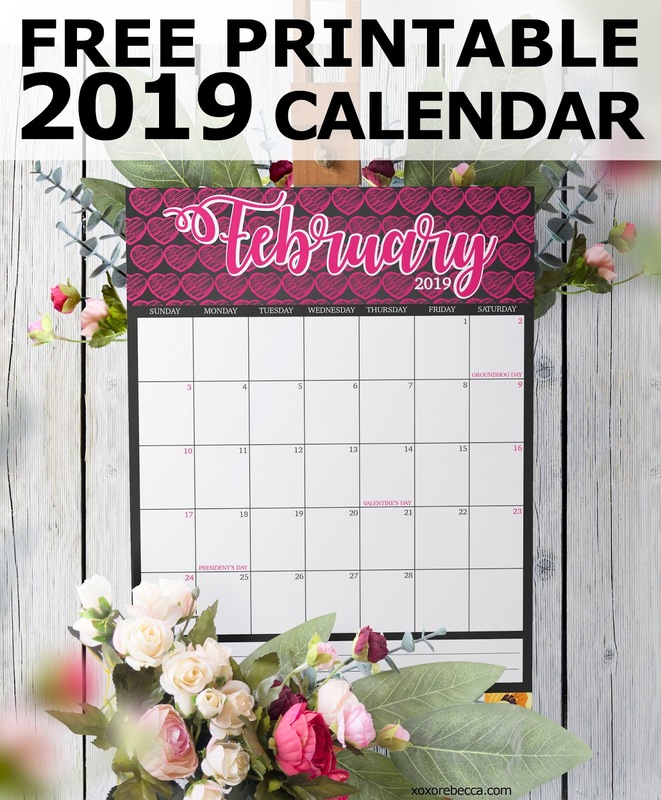 Let’s start at the beginning – I’m pretty indecisive so my fiancé and I spent a lot of time picking a date for our wedding. After lots of research and price checking for summer themed weddings, we finally ended up agreeing on December 14th. My next step was to figure out a theme that would incorporate both my fiancés taste with my style. I kept coming back to the idea of a winter wedding (I had just finished reading Game of Thrones and all I could think about was Winterfell!). I kept thinking of all the great options for decorations, food, gifts, etc. I think a lot of brides can relate to this- I spent hours upon hours looking on Pinterest for what the perfect winter wedding would look like, and it quickly became clear that this had the potential to be something very unique and amazing. I didn't come across too many true winter weddings that really incorporated the theme across all elements of the big day (including the décor, food, and actual weather! ), so I took it as a personal challenge to throw the best winter wedding imaginable. Aca-scuse me?! – That’s right I think my wedding was the best! We really wanted to start the process on the right foot, show our guests a little preview-winter is coming. So we incorporated the winter theme into the invitations. We felt that it really set the mood for letting people know exactly what they were in for...and to prepare for a little more of a “chill factor” with this wedding. 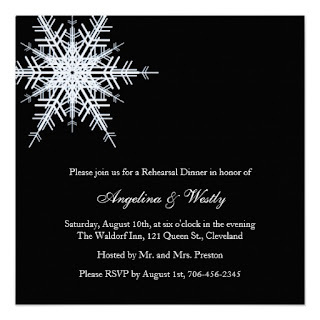 We used a sleek, super elegant black invitation with a stunning white snowflake. Sparing the elaborate details of how we transformed the church into an ice cave for the day, we will move onto the reception and more importantly, the table settings. Each table was clear glass to give that ice feeling to the whole reception hall. For the centerpieces, we used these awesome “cool blue” colored arrangements. We combined vases with white roses, colored pine cones with tinsel, and several candles of different heights and sizes to create the wintry look and feel (not to mention all the sparkles I added in when my fiancé wasn't looking). Probably the best addition that we decided to include was actually a suggestion from one of my bridesmaids. 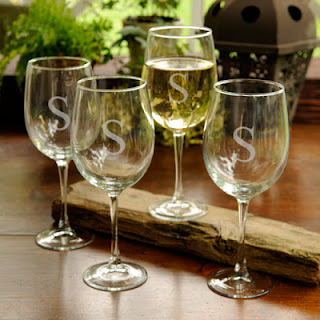 It was time consuming but we frosted personalized wine glasses to get a chilled look (and has lots of fun testing the process out before hand –accompanied by actually filling them with wine). For the general place settings, our guests glasses had our last initial on – we gave my bridesmaids glasses that had their own individual initials on them as part of their gift (Chris wanted something a little more “manly” for his guys so his gents got engraved flasks as their “winter-themed” groomsmen gifts ), but we actually frosted them by placing them (while wet) into the freezer for a few hours. It turned out perfectly, and the guests could not say enough about them. If anyone else decides to host a winter wedding, this is a “must have”. The icing on the cake was our wedding favors. The favors that we chose were personalized picture frames with snowflakes on them, with a picture of us inside on our first date. We really wanted to leave our guests with a memory of the night and our love we share. 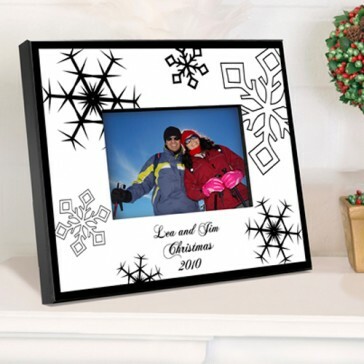 When people look around their house and see the picture sitting on the mantel in the snowflake picture frame, we immediately wanted them to think back to the wedding and all of the amazing fun that they had. It was our way to try and make the wedding last forever in the minds of our guests, just like it will for us.